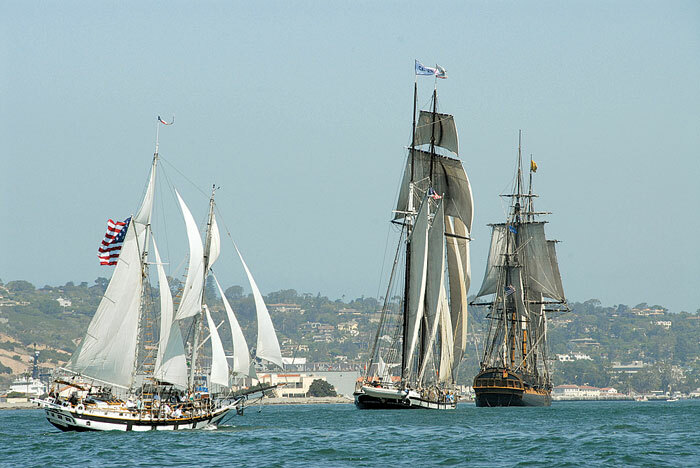 SAN DIEGO — Coming Labor Day weekend, a fleet of historic ships will set sail for San Diego Bay, celebrating a weekend of maritime history, entertainment and adventure. The annual Festival of Sail will feature more than 20 tall ships sailing into San Diego Bay and docking for public tours at the Maritime Museum of San Diego docks, Aug. 31-Sept. 3. The festivities begin at 11 a.m. Aug. 30 with a parade of historic vessels on San Diego Bay, announced by cannon fire before they come to the end of the parade route at San Diego’s North Embarcadero. “The Festival of Sail offers San Diego residents and tourists an opportunity to experience the rich maritime history of the Port of San Diego’s waterfront,” said Lou Smith, chairman of San Diego’s Board of Port Commissioners. There will be a total of nine visiting ships in the parade, including the Ocean Institute’s Spirit of Dana Point, which is a traditionally accurate replica of a 1770s privateer vessel used during the American Revolution. The opening parade in the harbor gave boaters a front row seat to some of the area’s most historic ships, and shoreside viewers watched the vessels from the maritime museum, Cabrillo National Monument, local restaurants on Shelter Island, Harbor Island and the North Embarcadero, as well as Spanish Landing Park and Harbor Island Park. The festival vessels, docked at the San Diego Maritime Museum along the North Embarcadero between Ash and Grape Street, will be open from 9 a.m.-7 p.m. through Sept. 3. More than 100 arts and crafts vendors are expected to be on hand for visitors, as well. Festival attendees will have the opportunity to purchase tickets to tour each tall ship and learn its history. The festival will also feature a petting zoo for kids, live entertainment and vendors serving food and beverages. Single-day tickets for the Festival of Sail are $15 for adults and $10 for children 12 and younger, seniors and military. Multi-day passes for entrance to all four days of the festival are $25 for adults and $20 for children, seniors and military. Admission also includes a visit to the San Salvador construction site at Spanish Landing Park. Guests can tour the construction site where master shipbuilders are creating a replica of explorer Juan Rodriguez Cabrillo’s 16th century galleon. Parking along the North Embarcadero will be limited. Festival visitors can use public transportation and walk from trolley or bus stops to the event. For more information and ticket purchases, visit sdmaritime.org.